GOD COPS: Family Research Council Backs Campaign To Emblazon "In God We Trust" On All Police Cars - Joe.My.God. Police in one North Carolina county got a different kind of offering from Fairview Baptist Church: car decals. The stickers are part of a nationwide push to put “In God We Trust” on the fleets of law enforcers. 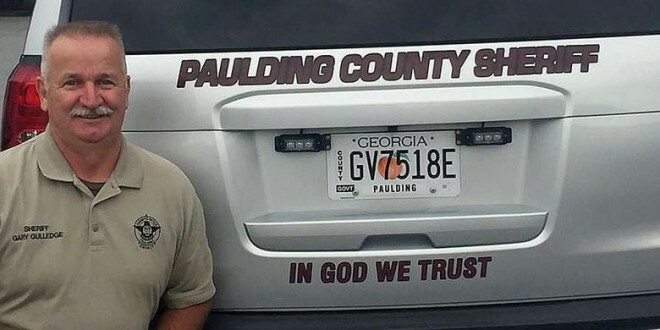 From Florida and Texas to the Carolinas and Virginia, policemen are combatting the negativity about law enforcement by proudly posting “In God We Trust” on their fleets. No one knows quite how it started, but local communities have been pitching in and paying for the decals on tens of thousands of cars. Just as he said so, Virginia Sheriff J.D. Diggs announced that York County is adding the motto to all of his patrol cars — one of the many places where the idea has caught fire. “The legislatures and courts approve,” he pointed out, “and God is most certainly approving of this.” It may seem like a small thing, but this is a great way for churches to have an influence on their community. If more pastors came alongside local leaders and encouraged them, there’s no limit to the impact they could have. The more people who see the connection between God and government, the better! “E Pluribus Unum” was considered the unofficial motto of the United States until Congress formally adopted “In God We Trust” during the height of the Cold War. Hundreds of photos like the one above can already be found on Google Image.